Protocol Gateway between M-Bus, Modbus RTU, Modbus TCP/IP and LonWorks FT (>1000 data points). The server not only allows you to access, control, and monitor electronic devices, but also lets you use data intelligently to save energy, improve operations, and lower maintenance costs. Easy to deploy and manage, and capable of both local and remote control, the SmartServer offers unparalleled flexibility. Use it as a standalone server, or integrate it with the control system of your choice. With built-in drivers for industry-standard protocols like Echelon’s LonWorks® technology, SOAP/XML, Modbus, M-Bus, digital I/O, and pulsecount input, and custom driver support for everything else, the SmartServer offers unprecedented connectivity at no extra cost. Application Examples: SmartServer Brochure (PDF). 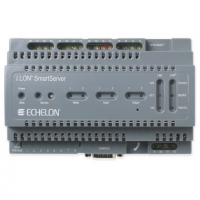 Additionally, i.LON SmartServer IP-852 Routing can be upgraded and Custom Applications and Drivers can be installed after upgrading the i.LON Programmabilty feature.